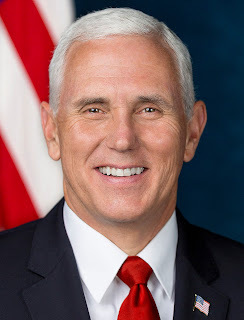 U.S. Vice President Mike Pence will speak today at the annual meeting of the Southern Baptist Convention. No, he's not a Baptist. But he has the right faith for them - Republican. Pence's appearance will follow a trend of GOP presidents and vice presidents speaking at SBC meetings, including Gerald Ford (1976), George H.W. Bush (1982, 1991), Dan Quayle (1992), and George W. Bush via satellite (2002, 2004, 2005, 2007). Other Republican White House officials have also spoken, like Condoleezza Rice (2006). None of those individuals are Baptist, and most of those appearances came in even-numbered years, which are national election years. Not among those speakers? Southern Baptists like Al Gore, Bill Clinton, and Jimmy Carter (although Carter spoke at a related meeting of the Brotherhood Commission in 1978). Actual Baptists, but each is also a Democrat. In that context, Pence's address is clearly part of a partisan trend that prioritizes party over faith. It can't even be said to be about the abortion issue given the snub of Carter and the embrace of Rice. As I noted in a recent episode of "Baptist Without An Adjective" about the Missouri Baptist Convention inviting a Republican governor to speak at their annual meeting, partisan politics is trumping religious principles. Fortunately, some Southern Baptist pastors are tired of this politicization of their meeting. Yesterday, two messengers unsuccessfully moved to disinvite Pence and three others offered motions to prevent invitations for politicians (other than host city mayors) in the future. This level of pushback from the floor of the meeting is unprecedented. Even though the efforts to stop Pence failed, hopefully the messengers who spoke out sent a message to SBC leaders to think twice before again turning the pulpit over to a politician. The Washington Post ran a good article today about the controversy that erupted around Pence's scheduled appearance. And I'm quoted in that piece a bit about the history of politicians speaking at SBC meetings. I hope it adds to the dialogue about whether this is actually appropriate or helpful. I find such religious-political moments problematic. I've talked more about my thoughts on these types of occasions in books like Sacramental Politics: Religious Worship as Political Action and Vote Your Conscience: Party Must Not Trump Principles.